My Little Patch of Sunshine: How Much Fits in My Frigidaire? One of the things I worried about when I found out that I was chosen to be a Frigidaire Test Drive Mom was that the counter-depth refrigerator wouldn't hold as much as my standard refrigerator. After a couple months of using it, I can tell you that my worries were for nothing. 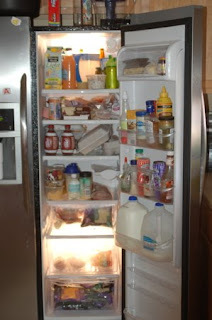 I can fit plenty of food into my new refrigerator, and with a family of 5 -- that's usually a lot of food! You can see how 2 gallons of milk fit easily into the shelf on the door. I can fit our condiments and salad dressings on the door shelves. Below the milk is space for 6 cans of soda, and below that holds water bottles perfectly. The 3 drawers are big. I keep our cold cuts and cheeses in the top drawer, and kept finding them 1/2 frozen. Finally, I looked carefully and noticed a temperature slider near the drawer (which is called the "chiller" drawer) and was able to move it from coldest to not so cold. My cold cuts no longer freeze! Our shelves are not as neat as they could be, but I decided to keep it real and show you what my refrigerator really looks like today! There is plenty of room for all our groceries, and I haven't even used our old refrigerator since we moved it to the garage. Frigidaire is still running the great contest for a new washer/dryer! And, don't forget about the "More Me-Time Guarantee" if you're in the market for new appliances.